Looks like Cain Velasquez is looking to get back in the octagon soon. Going by what his coaches have said, he's ready to go but he wants a new contract from the UFC, which is causing both sides to hold out, hoping one buckles eventually. How do you see Cain getting on and who do you want him to fight next? Stipe v Cain for the GOAT title should be on the cards, surely. In a perfect world they hold that off for the vacant HW title. Mad to think Cain hasn't fought in well over two years and has only had 3 fights in over 5 years. Points to how absolutely battered his body is. Although, given his noted insane work ethic, it's to be commended he's managed to chill for those 2+ years and let his body recover from the battering. Serious note, Cain’s been gone so long now that it’s pretty much impossible to predict anything because we just don’t know what we’re getting at this point. He looked great when he came back at UFC 200 and that was following a long layoff, but knowing how fucked Travis Browne was by that point I don’t know if it says more about Cain or Browne’s form at that time. There’s no real way to get a read on it. I think they need to put him in with someone outside the top boys for his first fight back. A top ten guy but not someone like Stipe or even Blaydes. I’d do Cain vs Overeem or even a Werdum rematch if he’s back from the USADA naughty step by then. Established names but also older fighters on a little bit of a slide. its a shame Cain's body fell apart on him, who knows what kind of resume he'd have built up. I reckon he'd have reclaimed him title and would still probably be defending it. Cain at his best was perhaps the best head to head fighter in MMA history. He wasn't unbeatable as JDS demonstrated, but he was the closest thing to it when the stars aligned. I would favour a prime version of Cain to beat the best versions of Miocic, Fedor, Jones, etc. However, I don't think he'll ever get back to his best or even close to it. The injuries and lay-offs will have surely taken their toll. I think he'll be good enough to be competitive against the likes of Werdum and Overeem. I would slightly favour him to beat both. But I would favour Miocic to beat him. I might even fancy Bader to upset him as well, as baffling as that sounds. Would Bellator be a better option for him ? nah i dont think so, if he can stay fit the UFC is where he should be. Yeah he should be where the best heavyweights are. And Bellator might not even be a real option anyway. I know it's been reported Cain wants a new contract but he still might technically have fights left on his current deal. If they can't come to terms, who knows, maybe Bellator or ONE will be in the running but I think they'll work it out. There's unfinished business for Cain in the UFC. He has to fight in there again, at least once anyway. Fighting in Bellator, ONE or RIZIN or wherever, won't answer any of the 'what could have been' questions that hang over Cain's career. I'd be gutted if we don't get Cain v Stipe before Cain decides to give it up. It's legit the two best HWs in UFC history squaring off, even if one of them is probably off-prime. Be incredible if Cain comes back to smash. From what I've read, it's been proper underplayed how battered Cain's body was after all that AKA abuse. Of course, you've got that story of him getting pulled from a fight when the UFC found out he could only train for about 15 minutes before his legs started going numb, which goes to show what sort of man we're dealing with here. Him choosing to sit out for so long points to how battered he was/is. On the flip side of some of the comments, maybe the time off will actually help him in the cage. 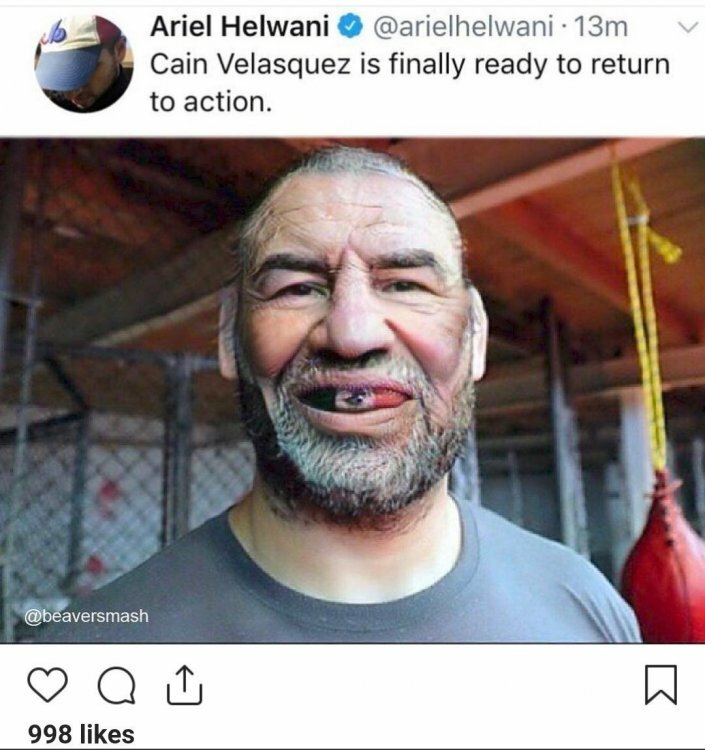 I think we can all assume Cain went into a lot of his fights with terrible injuries - again, the bugger was willing to fight despite his legs going numb after 15 minutes of training. I'm not sure if Cain can reverse some of the damage he's done to his body, he's maybe too far gone, but hopefully he's done the business to at least ease most of them. In Cain's case, time off is maybe what he needed most. But, aye, we shall see. The issue with Cain is he's so private that you rely a lot on heresy to get some juice on him. He was apparently at the WWE performance center a few months back and is seriously considering WWE after he's done. Depending on how his body copes, you imagine he'll be lucky to get 3 fights in before calling it a day. Aye, AKA's training methods have probably ruined Cain. Similar to how Chute Boxe's training regiments cut short many of their fighter's primes in the 2000s. I also wonder if the wars with JDS used up some of Cain's mileage. Their third fight in particular was brutal. JDS has struggled to find his form on a consistent basis since their trilogy. Cain in WWE seems such an odd fit though. He doesn’t have the kind of personality, well any personality really, that you’d think would translate to WWE. And if his body is as bollocksed as we all think then I can’t see how he’ll be much better off with wrestling training either. It’s a shame but he might just be too far gone. Hopefully not. I’d love nothing more than to see him do a Cruz and come back better than ever. Yeah. I wasn't having the WWE talk too, but he's apparently really into the idea and Helwani has called him out a few times for being a closet fan. Who knows, maybe WWE can bring out some personality in him. Kurt Angle, for example, wasn't exactly a ball of charisma pre-WWE but he went into it with the commitment that won him his gold medal. Given Cain's similarly brutal drive, maybe he gives it his all and figures it out. I agree that I have no idea why he thinks his body will cope with WWE grind, but then again Cain will probably go the same way as Angle with that. Mad bastards. If he does, he's got an immediate, potentially big-money feud with Lesnar waiting for him there. "The man who ended Lesnar's reign of terror in MMA", and all that. Problem is, of course, he'd need to be trained up before he could do that, and sticking him in NXT for a year while he learns his craft could take the edge off the "Wow" factor for him. Cains not going to go to NXT for a year, he's aging, they will probably just teach him the basics, he's a natural athlete, he'll be doing at most a Ronda Rousey schedule and practice for a big match every other month, he won't be doing any house shows I wouldn't have thought. He has a much bigger name than Shayna Bazler & Matt Riddle and obviously is a former 2 time UFC HW champion. He could also get a job training basic amateur wrestling and certain BJJ stuff to some of the newbies and just live cheaply in NXT in Florida, Seth Petruzeli does that with kickboxing. i was listening to the Anik & Florian podcast last week and they spoke of DC's accomplishments and they said something like "DC has a strong case of being labelled the best heavyweight off all time, along with Fedor, Cain Velasquez and maybe Randy Couture, some may include Stipe in that list but you cant discount what DC did to him", and it felt totally dismissive of what Stipe had achieved. If Stipe had defeated DC i think he'd be the clear greatest in terms of accomplishment. One loss though and hes almost the nearly man of the discussion. Obviously its an opinion but i thought it was worth noting.